We are under attack! Instead of telling you to run and take cover, however, we advise you to come closer and listen. 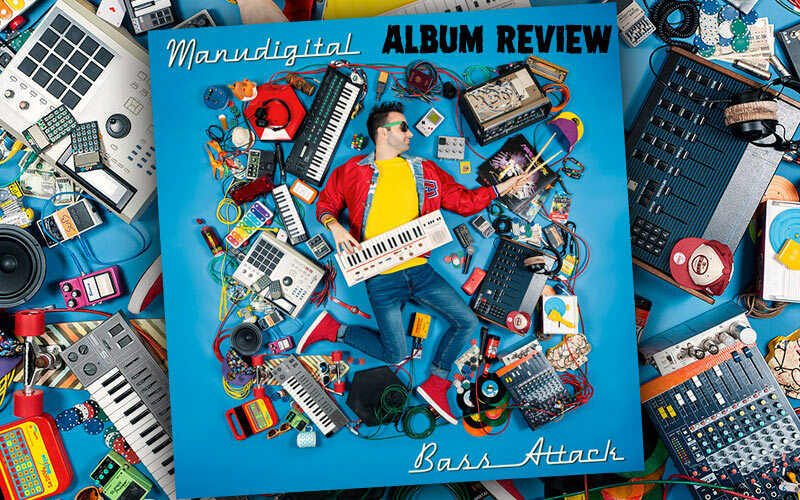 After touring extensively for his solo-debut Digital Pixel in 2016/17, French producer Manudigital took to his studio once more to create the heavy follow-up Bass Attack. His second album is, again, a display of mad riddim-building skills and a well-considered choice of both veteran singers and young MCs. Thus, the unforgotten Lt. Stitchie graces the track Winner, featuring the lesser known singer Derrick Parker, while extremely talented youngster Taiwan MC heats up Reach The Sky. Instant stand-outs are the General Degree tracks Ruff It Up (positioned prominently as intro of the album) and Bad, a pushy tune decorated with a distinctive sample of Nadine Sutherland's 1993 hit Action. In case you need any more grippage than the audio provides, watch the video which is out since June - hommage to both the indefatigable singer and Jamaican dance crews! Style-wise, diversity is the motto. Thus, we hear Rubadub in Strictly That Style, a tribute by upcoming French artist Dapatch to Junior's eldest brother and DJ Jim Kelly who was shot in Spanish Town in 1983. Rootsy sounds have their place with Cali P in Rub A Dub and Red Fox' Bye Bye Boom Boom, as does Ragga-Dancehall with Mesh M 18 in Nah Fight. There is an almost oriental passage in Junior Cat's contribution Shoot & Collect, as well as a trip into the fast-paced breakbeats of Jungle in Time Bomb, featuring Devon Morgan, Sherkhan and Ed Solo. While the rock-excursion with Skarra Mucci in Rock This World is not quite to my liking, the innovative My Story featuring Lyon's celebrated producer/ performer crew Panda Dub and vocaliste Royale calls for repeated pull-ups. Of course, the purely digital Reggae that is Manu's trade mark make up an essential part of the release too, such as Herb Inna Mi Pocket (perfectly casted with Solo Banton) or Dem A Poison to which Soom T contributes her unmistakable vocal prowess. Despite all this variety in vocals and styles, there is one thing all tracks of Bass Attack have in common - a strong, thunderous, speaker-blasting bass. And, well, ain't that a great thing to be attacked by?